Gil Hovav (left) and Jack Gottleib. Imagine you are visiting Barcelona and want to know the Jewish museum’s operating hours; where to catch a Ladino theater performance; or how to find the city’s synagogues and other Jewish sights. You might also want to share the Jewish travel information you do have—from operating hours to an intriguing fact you learned on a private tour—so others can benefit from your experience. Now, with an assist from a tech-savvy Israeli culture vulture, it’s all possible. “There’s never been one resource designed to enlighten people about Jewish cultural heritage and drive them to visit these places,” said Jack Gottlieb, a Tel Aviv-based innovator who is funding the tech-based initiative World Jewish Heritage (www.worldjewishheritage.com), largely with his own money. The site is designed to be a continually updated, community-based resource for Jewish cultural information and will interact virtually with WJH’s other products, the first of which is the new eBook Israel’s Top 100 Ethnic Restaurants, showcasing Israel’s ethnic culinary gems. 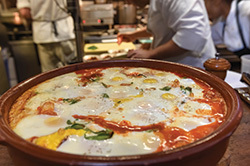 Shakshuka is an Israeli culinary treasure. Acknowledging the power of food to translate culture, Gottlieb accordingly chose the subject for WJH’s first single-subject offering. He tapped Israeli food scholar and television personality Gil Hovav to contribute the forward. Hovav flew to New York to celebrate the eBook’s launch at a food-filled event at New York’s Balaboosta restaurant. As waiters passed around mini pita sandwiches and mint cocktails, Hovav recounted a tale of making shakshuka for volunteers after 9/11. So the next time you are in Israel—or Italy—and want to know where to eat matbucha or view a Modigliani, you know where to turn. so I clicked and got on a Hadassah website for an app, Travel Tools, etc. there is no link to an ebook.